Our Learn from a Leader series is our way to share the tremendous, varied expertise of our leaders with the whole ioby community. We hope you enjoy! Mac Levine, MPH, is the founding executive director of Concrete Safaris, and hopes this article gets you to play and learn outdoors more often. When not teaching kids to turn public land into gardens, obstacle courses, and bike routes, Mac is stand-up paddleboarding in the Hudson River or hiking with her dog, Zipi. Concrete Safaris’ Mad Fun Farm and Jefferson Gardens, founded with 7-to-12-year-olds in 2008 and 2013 respectively, are the first and largest kid-centered gardens on NYC Housing Authority property. 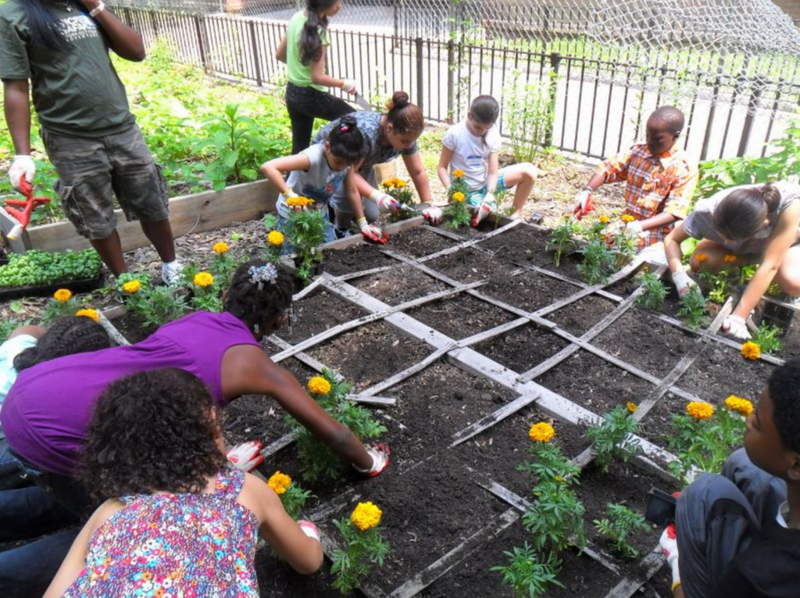 Concrete Safaris teaches children from East Harlem how to research local food preferences, design and build gardens, spread wood chips, shovel topsoil, weed, and more, to help them become healthy leaders and environmental advocates. Right questions, right people. Ask yourself: what is the need I’m trying to address? Is a community garden the right way to address it? Who are my primary stakeholders: kids, seniors, families, potential funders, the City (aka landlord), Parks Department? Can I commit at least 3-5 years to manage this project? Then ask yourself who else can help you, but don’t cast too wide a net—you’ll never get everybody! Find people in nearby buildings, a community center, or others you know who’ve already demonstrated an interest in gardening or helping their community. You don’t need a lot of people—just good people. Clarify expectations. Contact the government agencies you’ll need to work with early, and build their investment. Ask your garden partners how they envision the garden. Will it grow food, flowers, herbs? How big? What amenities? When will it be open and how will people access it? What will the land owner allow? Understand that needs and wants may change over time, but distill and communicate clear goals from the beginning. Plan the particulars. There are many moving parts to running a successful community garden. Think about how and where you’ll store your tools. Announce work days well in advance so people can plan for them. Will you seek nonprofit status to receive grants and donations and buy insurance? No matter what legal structure you put in place, how will you get organized—will there be a president, secretary, treasurer? How often will you meet? Set up a plan for regularly evaluating your progress, and receiving and incorporating feedback. Safety first. You will need garden-specific liability insurance; research and plan to buy it. People use tools and sharp objects all the time in gardens, so make sure all participants get the same safety orientation and follow the same rules. Sample rules include: always wearing gloves, making sure shoes are tied, not leaving nails on the ground, no running. Make sure everyone knows what to do if an accident or altercation occurs. Program and promote. Ask your partners and stakeholders how they want to use the garden: do they want to hold workshops, put on performances, have barbeques? Do they want a Quiet Zone and a Social Zone? See what people want to do, then get the word out as often as you can, using social media, print materials, and your partners’ networks. This will depend on your motivation and expectations, but no matter how well-connected or committed you are, it will take time. Start planning a year in advance so you can be sure to meet all deadlines, get all permits, etc. (though remember you don’t need to accomplish all your dreams in the first year!). Keep in mind there might not be a protocol to follow if you’re the first in your area to do this. Develop a realistic timeline of when tasks will be completed, and by whom. 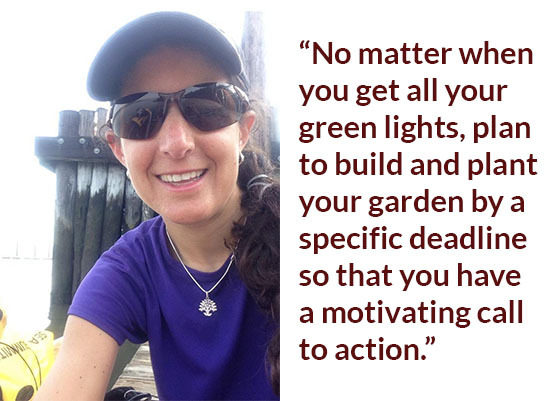 No matter when you get all your green lights, plan to build and plant your garden by a specific deadline so that you have a motivating call to action. It all depends on the space: what you can take care of, how many volunteers you’ll have, the size of the area, where you’ll source your materials, etc. Assess your resources and goals and create a budget based on what you have, need, and want to accomplish in your first year. This will also depend on your individual needs, but some suggestions are: lumber, corner brackets, screws, cordless drills, topsoil, compost, woodchips, transplants or seeds, trees, rakes, and wheelbarrows. – People in your neighborhood who know about gardening!